My home city of Lipa is also home to a base of the Philippine Air Force. The place is called Fernando Air Base, named after a Filipino hero who dared to go into aerial combat against the fearsome Japanese Mitsubishi Zeroes in his antiquated Air Corps fighter plane at the onset of WWII in the country. The base is where I grew up. This is where the Air Force teaches new recruits or student officers how to fly. During my time, the base was called the 100th Training Wing. In the late eighties, the wing was dissolved and taking its place was the Air Education Training Command or what personnel now call the AETC. 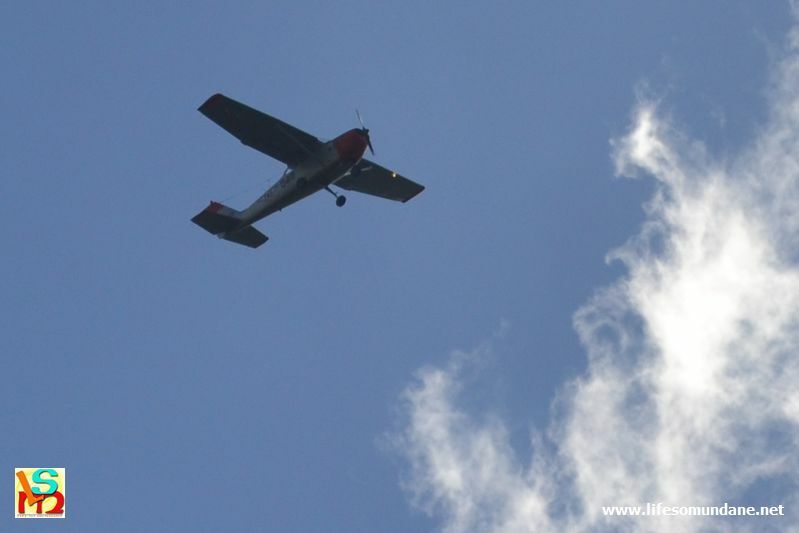 Those who live in Lipa, therefore, are so used to seeing these light aircraft going round and round in circles above the city most especially during the training seasons. When I was a small boy, the main training craft of the Air Force were the unbelievably noisy T-28 and T-34, both of which were subsequently phased out. Later came the mercifully quieter T-41 with its distinctive wings above the fuselage; and much later the sleekly designed trainer we just all learned to call the Marchetti. These still fly in the present day. Having always been interested in these ‘signposts’ that pilots use as they circle the city, I took advantage of the conversation to ask if the gas station next to my house is included in the manual. Sometimes, the planes fly one after the other in carefully sequenced routines. Other times, they fly in formation. The planes are part and parcel of life in Lipa that most of the time those who live in the city hardly pay them any attention. Growing up in the base as I did – and having once wanted to myself become a pilot – I have always given these planes more than just passing interest. After my Dad retired, in 1971 our family moved to a property a kilometre or two west of the base. Most of the time, the planes would bank northwards in front of the house and then complete the arc northeast behind it as they lined up to land in the short runway inside the base. Depending on the direction of the wind, sometimes the planes took off into the west which took them right behind our house. The planes would then bank southwards to start their circular flights around the city. During the day, and especially since light planes do not fly all that high away from the ground, pilots enjoy the luxury of being able to navigate visually. That is why I have always wondered what sort of landmarks these pilots use during their routine flights around the city. I mean, there are no roads up there, get it? As it happens, I have a former player who is currently training to be an Air Force pilot. He joins us for Sunday football now and again. We play small games on a hard court in this subdivision just five minutes from where I live. Naturally, none of us had a clue what he was talking about. So he proceeded to enlighten us. The swimming pool with bridge, he told us, is one of the landmarks included in the training manual that they use. That explained a lot. I mean, in previous Sundays, we kind of noticed that the T-41s that flew overhead rather tended to bank northwards almost directly above the court where we play, which is just across the road from the clubhouse. This player of mine must have seen the clubhouse countless times looking out from his training planes; but Sunday was the first time he was seeing the pool at ground level. His delight was quite remarkable. Yes, he confirmed. There are, he said, actually two gas stations included in the manual. The other one is north of the city. Well, I told him, the next time you turn to land behind my house, make sure you wave to me if you see me. “Just make sure you don’t buzz my house,” I warned.